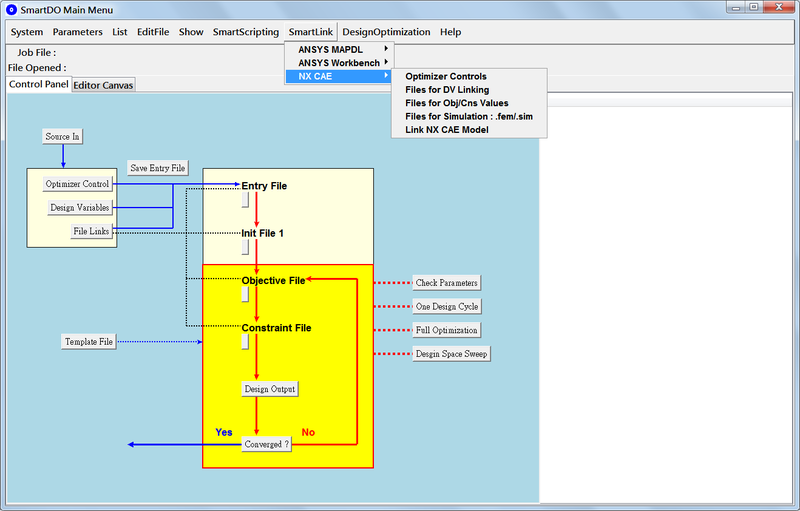 FEA-Opt Technology, the maker of SmartDO - A Smart Design Optimization System, today announces the release of SmartDO 7.0, which continues to improve its computational efficiency, reliability and flexibly user interface in this version. SmartLink provides direct link to existing CAE packages, which enables the users to set up design optimization model on the original CAE model easily. With SmartLink, it is not necessary to work on complicate process integration. With the Smart Direct Global Search Technology, there is no need to perform parametric sensitivity study either. SmartLink simplify the design optimization task to a Click-and-Go manner. Responding to the customers feedback, SmartDO 7.0 integrates Control Panel and Editor Canvas into one windows, separated by tabs. The Control Panel is no longer floating along as an separated windows. See Figure 1 for the new layout of the GUI. SmartPET and PET are innovative tools for user customization and programming, which allows the users to embed Tcl/Tk scripts into any text file by means of preprocessing it. They are flexible and powerful utilities for customization, process integration and data flow linking. SmartPET is based on the original PET technology with even more convenient programming interface. There are more new features in SmartDO 7.0. Please see the online manual of SmartDO, or contact FEA-Opt Technology and SmartDO distributors.